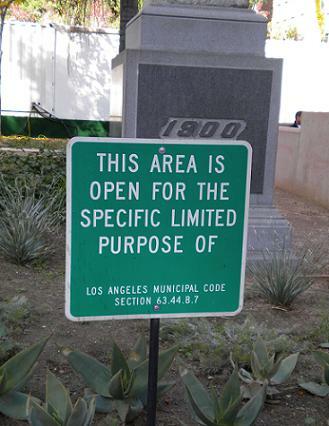 This sign in L.A.’s Pershing Square isn’t as limited as it thinks. Update: “This sign about covers it,” remarks LA Observed. 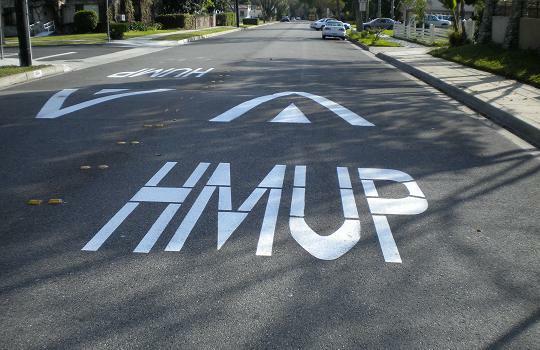 Gibbs Street in Pomona last week got street humps, one of which has a jarring spelling. Thanks to reader Don Stockwell for the tip. 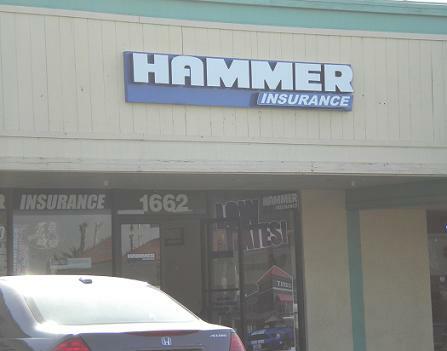 This Pomona insurance agency might be perfect for anyone prone to hitting their thumb while pounding nails. A few weeks back I wrote about the new Shakey’s in Rancho Cucamonga and promised I’d revisit the one in Montclair. Pretty much the same food, obviously, but the Montclair Shakey’s holds a small place in my heart. After all, it’s the oldest chain restaurant location in the Inland Valley still in operation. The Montclair location has been serving up pizza since 1961, nearly 50 years, without a break. Any other chains that arrived earlier have closed. The enormous paddle-like sign out front is clearly original, as sign codes today would never allow a sign as large as a tennis court, and the exterior is basically unchanged too. The interior is revamped, however, other than a few lamps. But I like this Shakey’s anyway. The food’s fine and they do the Bunch of Lunch all-you-can-eat special from 11 a.m. to 2 p.m. weekdays ($7.50, drink extra). There may only be two pizzas out, not 10 as in Rancho Cucamonga, but this is a smaller operation. Assistant manager Gina Amir is one of the friendliest restaurant employees you’ll meet and it’s her personal touch that keeps customers coming back. 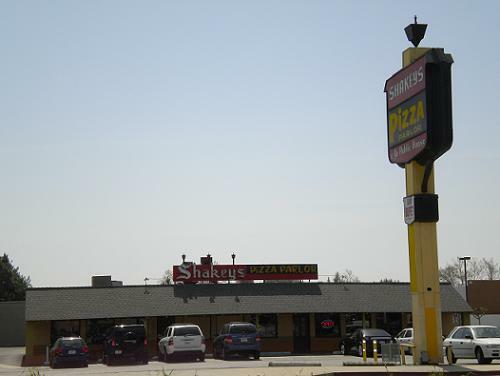 Frankly, this Shakey’s could use your business, so if you’re in the area and you like Shakey’s, check ’em out. I wrote a column about the place in 2006 that you can find by clicking below. In it I listed runnerups in the chain-restaurant longevity derby and at least two of them — Wienerschnitzel on Mountain in Ontario and Sizzler across Holt from Shakey’s, have folded since then. 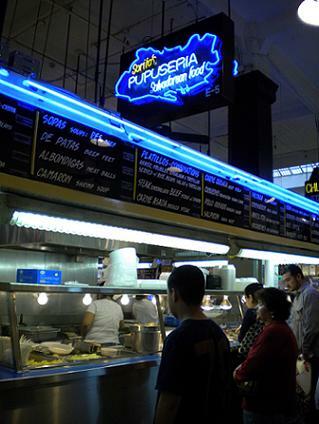 Last weekend a Highland Park friend and I met at L.A.’s Union Station, took the Red Line to Pershing Square and then walked to Grand Central Market, the indoor produce market and food-stall emporium that’s sort of a Latin-flavored Farmers Market. 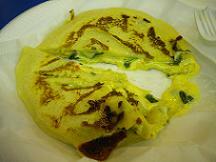 We got pupusas (a Salvadoran dish) at Sarita’s Pupuseria as well as an order of plantains. A pleasant time was had by all. This blog has been to GCM before, btw. On Sunday the Fox Theater in Pomona will screen its first English-language movie in what’s believed to be more than 30 years: “The Wizard of Oz.” Tickets are a mere $2 for adults and $1 for children. The screening is at 2 p.m. but if you get there earlier (doors open at 12:30 p.m.), you can get a tour. I used to watch “Oz” on CBS back in the ’70s when it was a Halloween perennial. Scared the heck out of me, especially the first time, but in a good way — right winning out in the end and all. But man, that giant floating wizard head with the smoke and booming voice, the Wicked Witch, the flying monkeys, the three friends donning furry guard hats and uniforms to enter the castle to rescue Dorothy…whew. I’ve seen “Oz” once or maybe twice since then in theaters at one re-release or another, where the B&W sequences were restored to the original sepia, if memory serves. It was still great. 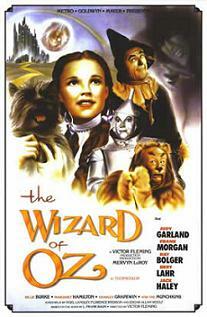 Any memories of “Oz” you’d like to share? The chain of 24-hour diners is opening its first Inland Valley location on Indian Hill Boulevard in Claremont immediately south of the 10 Freeway. 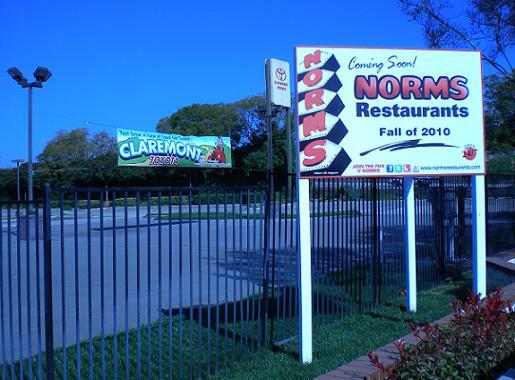 The closest of 17 Norm’s are in West Covina and Riverside. Here’s the Wikipedia page and here’s the official website. Chili’s used to be on this site but was demolished circa 2005 for a Claremont Toyota expansion that didn’t take. I’d say Norm’s is a step up from Chili’s, and not only from a novelty standpoint, but your mileage may vary. Pomona College was founded in Pomona in 1887 and decamped to Claremont the following year, while keeping the Pomona name — a decision that’s led to decades of confusion. Reader and history buff Paul McClure, using his pen name Pablo, penned a poem that he tells me is “ostensibly about the origins of Pomona College but actually recounting the effects of PC moving from Pomona to Claremont in 1888.” He suggests that Pomona may have gotten the better end of the deal. 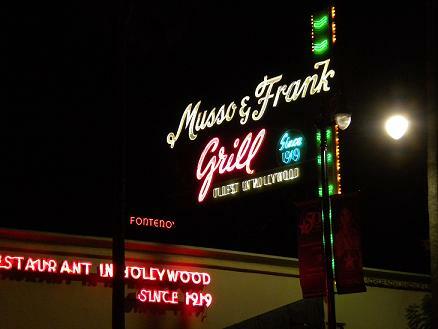 Like Philippe’s and Cole’s, Musso and Frank is steeped in L.A. history, numbering among the few holdovers from the era of Bogart and Chandler. Philip Marlowe would have frequented Musso’s, if he weren’t fictional, and Faulkner reportedly did. Musso’s has a reputation for surliness and a menu that hasn’t changed much from 90 years ago, dotted with bygone dishes like welsh rarebit, jellied consumme and diplomat pudding. I was always intimidated about eating there. Once about 10 years ago a friend and I stopped in for Cokes in the middle of a Saturday afternoon. When we ordered our lowly soft drinks, the waiter snatched the menus out of our hands and banished us to the bar, despite the nearly empty dining room. Yikes. Finally, after years of working up the nerve, I went in recently for dinner. Service was pleasant and professional, the steaks (from a coal-fired oven) excellent, the ambience thick. By golly, it’s my new favorite L.A. restaurant (this week). Some weekend I’m going back for lunch to sit at the counter and order welsh rarebit. Soul food, it must be admitted, is not my area of expertise. Nevertheless, I’ve heard good things about Chef Tim’s, a barbecue and Southern-style food joint in Alta Loma right off the 210 Freeway. It’s a small operation, seating for about 20, in a neighborhood plaza next to a used textbook store and a Tio’s Mexican restaurant. The eccentric decor includes a Toybox novelty vending machine. It’s comforting to know that even in the sophisticated 21st century, you can buy a whoopie cushion in Alta Loma. The menu has staples like ribs, pulled pork, fried chicken, shrimp, blackeyed peas, red beans and rice, po’boys, and chicken and waffles. 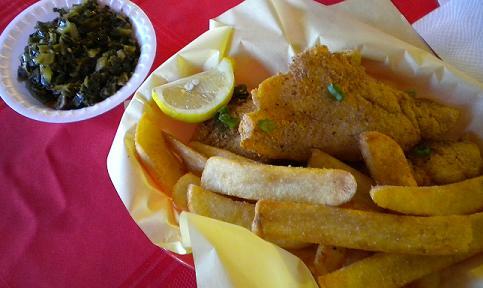 This first-timer went in for lunch on Tuesday and got a two-piece entree with two sides for $8: catfish, greens and fries. The catfish had a light, crispy batter, the greens were speckled with pieces of pork. Only the too-salty fries were left unfinished. The chef had just made cornbread and brought me out a square just to be neighborly. Unlike the crumbly cornbread commonly found, this version had a crunchy top. It’s the best cornbread I can remember eating. You won’t be a stranger long at Chef Tim’s. “How are you doing, Mr. Dave?” Tim Hanson called across the room as I ate. Uh-oh, there goes my anonymity. But it turned out he had no idea how he knew me or my name; he was sure that I’d been in a couple of times before and didn’t know what I do for a living. He must have a great storehouse of names and faces in his head; either that, or there’s another guy named David who looks like me roaming around (the poor sap). The meat is cooked over oak and mesquite in two drum-like smokers out back. Hanson has 20 years of restaurant experience, but Tim’s, which opened in January 2009, is his first venture. I’ll have to go back for a po’boy sometime. Especially since he already knows my name. Here’s a charming YouTube video about Chef Tim’s. Dig his puffy hat.